This week we have a very different puzzle from Radler. Make sure that you read the setter’s notes first. Clues to multiple answers (such as 9, 28, 22d, or 22, 30) comprise a definition of each answer, and a further definition for the homophone the answers would create if combined. The individual definitions may be in any order within the clue, though the homophone is always first or last. Some of the homophones are approximate, and an ‘Allo ‘Allo accent (indicated) is necessary for one of them. 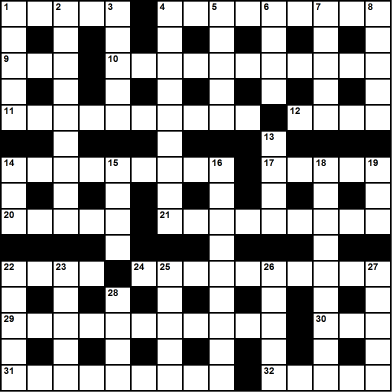 If you prefer your puzzles on paper, a pdf of the puzzle can be downloaded from the interactive version.